Building a website is easy, trying to maintain it with constant traffic is a whole different thing entirely. Often times the most common way to actually drive traffic is through paid ads and PPC but that is too costly and is very risky too considering that not everyone will go to your website if you do it wrongly. 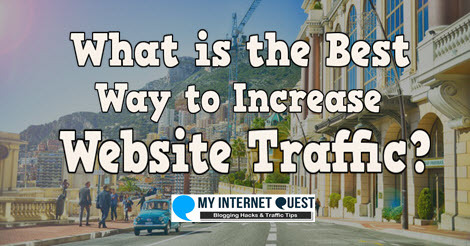 So what is the best way to increase website traffic today? The Power of SEO – What it Means and How it Works. SEO stands for Search Engine Optimization and simply put, it’s the art of ranking your website on the first page of Google. Organic traffic – This is the type of traffic everyone wants because you don’t pay to get them. Instead, they actually come to you! When you rank your website on the first page, people who are interested in what you’re offering will generally search and click on your URL to know more. Passive clicks – I’m not sure if this word exists but when your website appears in search results, it will stay there for many years to come hence giving you never-ending clicks even when you’re sleeping! The more content you have, the more clicks you are going to get and this is another great reason as to why SEO is so powerful. Very affordable – SEO is actually free of charge because all you need to do is write great content and learn how to optimize and tweak it an order which Google loves. You don’t need to pay anything unless you want other people to create content for you! So how does it all work you ask? The process it not something many people would like to spend time trying to understand though, because how Google determines your page rankability is hugely technical. There are a lot of technical terms going on such as Session ID, frames and DHTML which is something only computer scientists would understand. (Don’t worry, even I don’t understand the technical part of things). The good news for you is that you don’t need to know any technical terms in order to know SEO. In order for Google to rank your website page, it will send spiders to crawl all over your website and gather information so that Google may update it within its system. This is a good thing, because this gives Google information about your website so that it may rank you on the search results. How to do SEO Yourself? -Top 10 Steps to Always Bear in Mind. If you don’t have a website already, I’ve actually made a blog post on how to build one for free here. 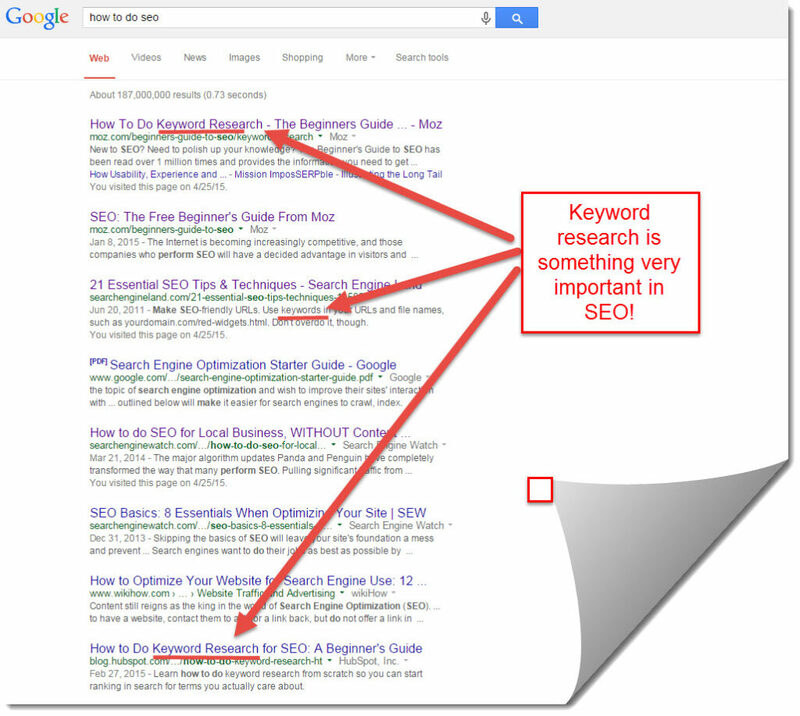 Every other blogs out there will tell you to focus on keywords. This alone is a very important that no Internet Marketer should overlook and if you look everywhere on SEO topics, it’s one of the first ones mentioned. Reason? Because it’s really powerful. You can use keywords for almost anything – Your content, your title or even company names because the reason they are called keywords is because many people are searching for these words all over the world. Examples of keywords are dating, losing weight or even how to get a girlfriend – Anything can be a keyword as long as they are highly-searched by people. So how do you make use of keywords? 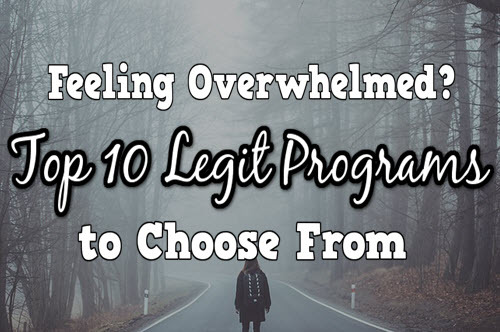 By now you should have gotten a ton of ideas on where to put your keyword which is why its a very popular traffic source but for SEO, your strongest advantage will be at the title. Think about it, the reason they are called keywords is because people are looking for it in the first place and when they type those keywords in search engines and found your website with that keyword, what are the odds of them clicking on your site? 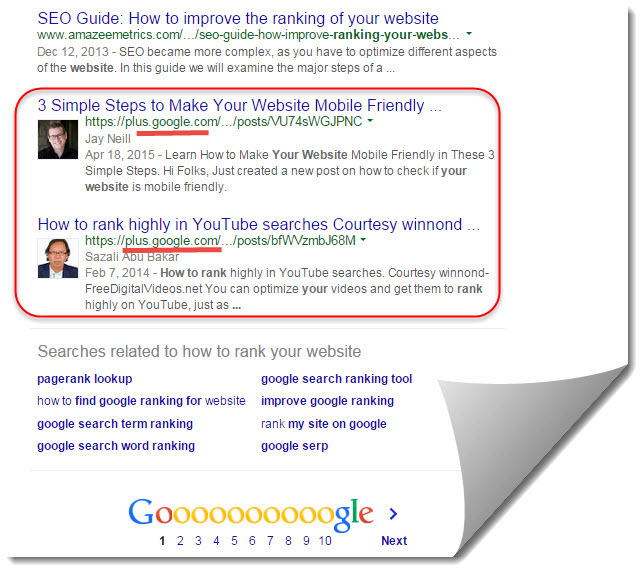 Your click-through will increase and when that happens, Google will also increase your rank in due time! So how do you leverage keywords then? 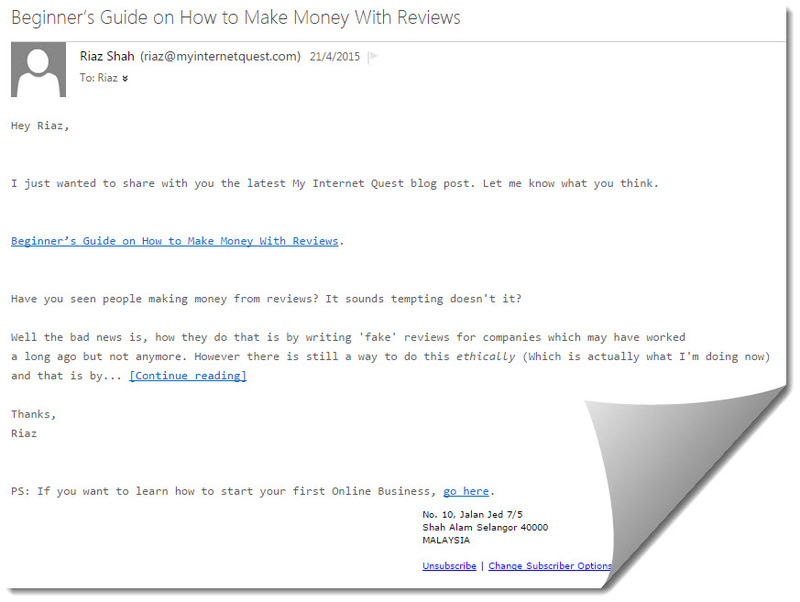 For that my friend, you will need a keyword research tool and the best one to date, is Jaaxy. From the search results, you can see that there are around 80 monthly searches with 189 competitors. Not bad I would say, because a rule of thumb to always bear in mind is to not exceed 300 competitors so in this case, I just found myself a pretty decent keyword! Just so you know, QSR stands for Quoted Search Results which represents how many websites are there for that specific keyword hence your competitors. 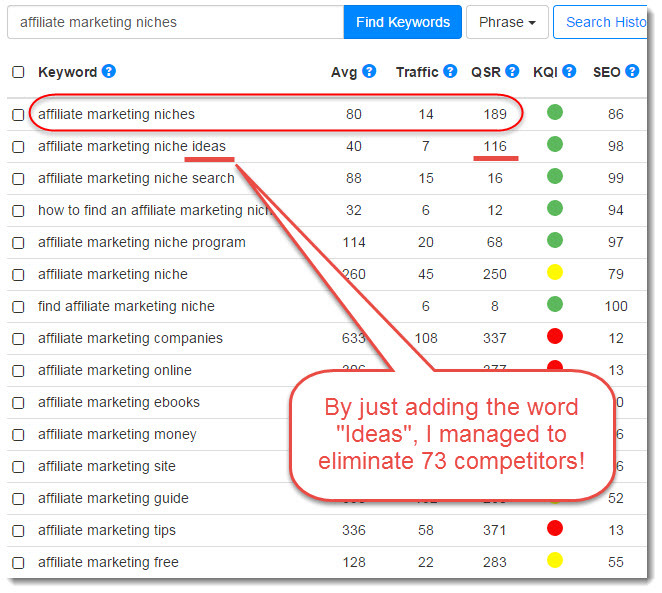 Not only that, if you look back at my screenshot above, you’ll notice that Jaaxy also found me another decent keyword which is “affiliate marketing niche ideas” and it has ONLY 116 competitors! It’s amazing how just by adding just one word, we can reduce the competitors by 73 websites! You can also add in those keywords in your content when you’re talking about something but make sure not to overdo it because Google will notice that as spam which is why adding a keyword within your title is the safest strategy to getting a boost for SEO. When writing content for SEO, it is important to bear in mind that you will need to be writing it regularly because if you publish just one content for your entire life-time, Google will mark you as inactive and drop your SEO even further. Ideas can be gotten anywhere but personally, I love using Google Suggest simply because the keywords there are real-time results of what people are searching at that time. Which means that you can get hot website traffic if you do something with these keywords because people are looking for them this very instant! Not leveraging the power of Google Instant is a one traffic mistake many beginners make because the thought of it never occurred to them as it seems petty and not worth their time but now that you know these auto suggestions are actually real-live questions typed by people at that instant, would you look at it the same way again? If you don’t know what Google Suggest is, it’s basically that automatic suggestion thingy that appears when you are typing in something within Google. Some people know it as Google Instant but it’s pretty much the same thing. Creating content is easy but people often find this as the most difficult thing to do. We all know how writing content has a very powerful effect on SEO but most beginners have a negative view on this simply because they think of it as a chore. 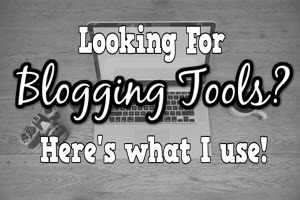 I used to think of it as a chore too because when I first started this very blog you’re reading, I was publishing contents every single day which made me hate my life terribly because that’s just it – I don’t feel like I do have a life anymore. Blogs aren’t meant to be sweatshop, it’s a place where you can express yourself and provide solutions to others through your experiences. Sure, you need to write regularly but NOT every day! A rule of thumb to always bear in mind is to write 2 to 3 posts a week but the absolute minimum is once a week. Write at least 1000 words –The minimum words your article needs to have in order for Google to notice you is 500 but that also means that every amateur is going to do the exact same thing. Be one step ahead of your competitors by writing at least one thousand words because this can help you rank much easier. 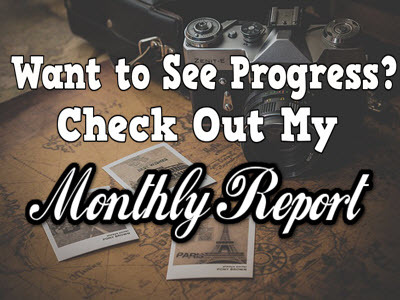 I used to write 500 words for each article but after deciding to take a leap of faith by writing at least a thousand words, I noticed that more and more of my posts are rising in rank. In fact, this very blog post that you’re reading is over 3,000 words! Solve a solution – The reason people type something in Google is because they want answers. This is something many bloggers miss out on and when writing your content, be sure to solve the question with detailed guidelines because if you don’t, your readers are going to jump to your competitors’ sites instead to find the answers that you cannot give. Write an engaging content! – Ever wondered why people love reading blogs rather than corporate websites? That’s because bloggers write with personal experience and that is also a very strong weapon for increasing SEO because the more engaged your readers are, the longer they tend to stay at your site! Include photo or don’t write as if you’re selling something because when you write with passion, money will come in when you least expect it. Step #4 – Writing your title with intent. Titles are your first line of attraction because it’s the very first thing people are going to see. When writing titles, do make sure that it is catchy one that just begs people to click on it. And instead of “radio for sale” you could opt for “Blue radio touched by a virgin goddess…” you get the idea. The trick is simple, find a keyword and add in a word or two to make in unique. The longer the keyword the better because by doing so, you appeal to a larger target audience hence eliminating some competitors so that you can rank much easier. 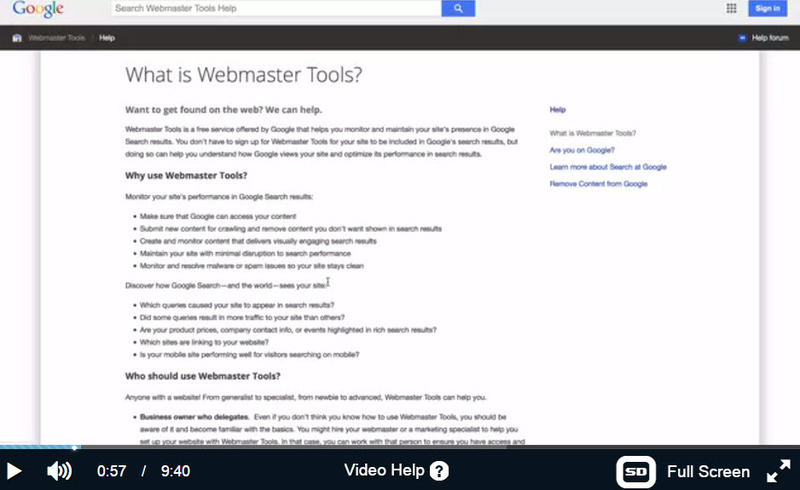 Using Google Webmaster Tools to fetch your newly-published content. This is a trick not many beginners know of. Whenever you finished publishing your content, what do you usually do? 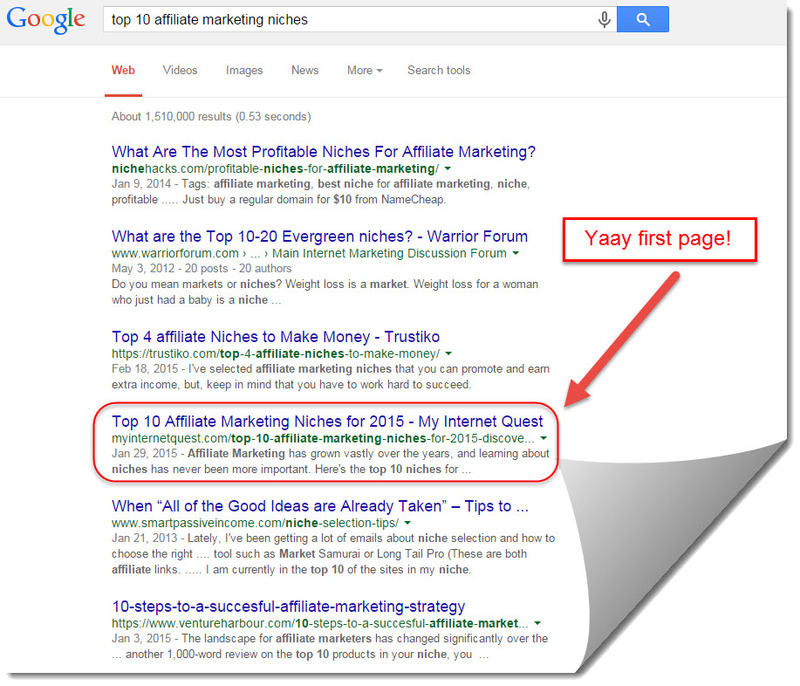 Wait for Google to index it so that your content may appear in Google search engines right? This process may take from 3 days to a week depending on how often you usually publish your post and the more frequent your publish, the faster your page gets indexed. However did you know that you can actually signal Google to come and index your site just after you finished publishing an article? You can, and that is through Google Webmaster Tools. If you already have your Google Webmaster account set up with your website, simply click on “Crawl” and from there, click on “fetch as Google” and you’re there! Do this for each and every article that you finished publishing and it will hasten Google’s indexing speed. We all know that Google is big and owns the majority share for search engines. However, Google doesn’t own all of it because it only holds 67% of the market whereas Bing actually has a decent amount of 19.5% which is almost a quarter of Google’s share! That’s a huge percentage that you need to make full use of! …type in your URL, get through that annoying captcha anti-spam to prove that you’re human and you’re done! 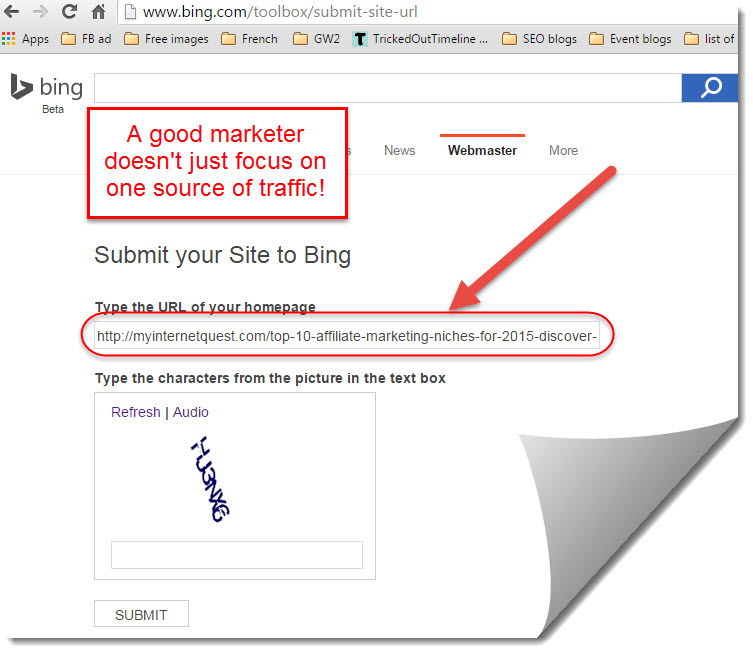 Now all you need to do next is wait till Bing indexes your content and you’re one step ahead of your competitors. Having traffic from Google is great, but it doesn’t hurt to get traffic from different sources as well and having Bing on your side is definitely going to boost your website’s ranking even more. Email marketing has no direct effect to SEO but it does affect it indirectly. When you have a list of a list of subscribers, make use of that by informing them of your new blog posts, put a little teaser and they are definitely going to click on that! A short email is always the best! Some people say that the longer your email, the better. This may be true on some cases but personally, I like to write short emails because not everyone wants to read a 1,000 word email explaining your new blog post when they can just click on your link to go there instead. The idea is to get your subscribers back to your website because Google will know that you have existing readers which means that your website will rise even higher because you have gained yourself the reputation of an established site! Step # 8 – Share Your Post Everywhere! How I share my new content on my social media accounts. 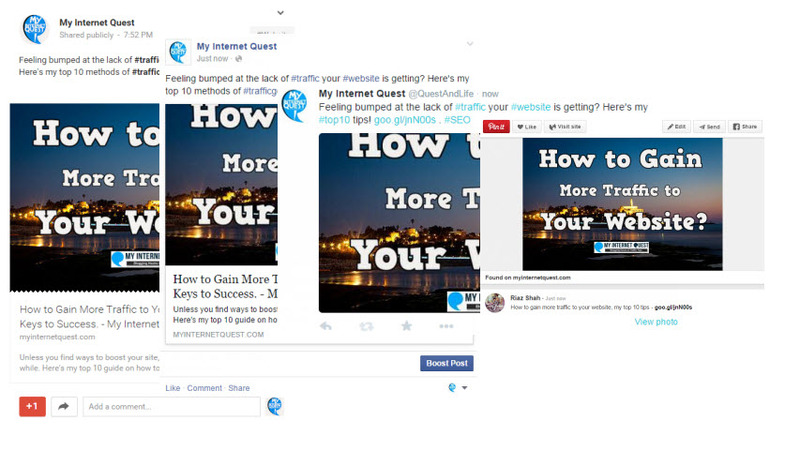 It’s important to get social because this will give you extra traffic from other established websites and not just from Google or Bing. Whenever you finish publishing your content, do make it a habit to share it on each and every one of your social media accounts because this will give you a much greater reach and bring in more people to your site. If you don’t have social media accounts, create one! You have to be social if you want to go big because even if you don’t, eventually you will get famous anyway if you grow your blog further as people are going to want to interview you, ask for a guest post, or even ask you to appear in their blogs! Like it or not, you will get publicity because that’s how we get traffic in the first place so instead of ‘waiting for the right moment’, start early so that through time, you’ll learn to pick up cool traits to improve your publicity even more. Step #9 – Time to utilize Google+! There is a reason why I don’t include this step with step #8 although it does include sharing your post to social media. 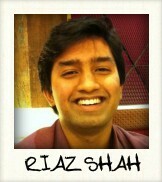 Google + is a very power social media whereby how you rank depends on you synchronize yourself with it. If you’re looking to dominate Google and get rankings from it, you HAVE to use Google’s products and Google + being one of it. Not only because Google + is a social media, but because it is also the very thing that can increase your ranking even further as an author of your blog. How Google plus gives you priority. Do you see how those pictures appear when other websites have only words? That is because those users are using Google + to share! The downside is that those people can only see you if you are connected to them in a way be it as a friend or follower but hey! Any traffic is a good traffic! This is Google’s way of promoting Google Plus because if you have tried it before, you may have noticed that it may not be as lively as Facebook, Twitter or Pinterest simply because it is still new. However by connecting with the other Google+ users, Google will reward you by making your post ranked high and this alone is a very powerful technique to getting traffic. Step #10 – Maintain consistency. I do agree that this is the hardest part of all because sure, you can write 10,000 words a day but can you do that every single day? (Don’t worry, nobody writes that many words a day). Willpower is very important because the SEO battle is a never-ending war and results do not come overnight. You need to regularly keep up your efforts because a lot of beginners give up halfway before they even see their website succeed. When first starting your website, you won’t be getting massive clicks and visitors on your first day, not even on your first few weeks. Your journey will be like a roller coaster and it will take some time before your graph will shoot up because your website will be like a ‘proving ground’ for Google to really notice you. This is for good reason too, because every month there are millions of websites being launched but shortly after, many of them gave up before even trying so you don’t want to end up the same fate as the others, do you? As long as you put in effort and continue creating fresh new content regularly, you’ll have nowhere to go but up. SEO Too Overwhelming? –Become a Student and Learn From the Best! I can teach you about SEO all day but my knowledge is limited and there are questions that even I cannot answer because truth be told, Internet Marketing is not my forte. I’m a hotel student for god’s sake, not a computer expert and I know even lesser about how the internet works but how I managed to build a website so Google-friendly that I am able to rank it high on the first page, is because I had help. If you want to dominate SEO, take baby steps and learn at Wealthy Affiliate University. Don’t worry though, everything’s online and you can learn at your own pace. 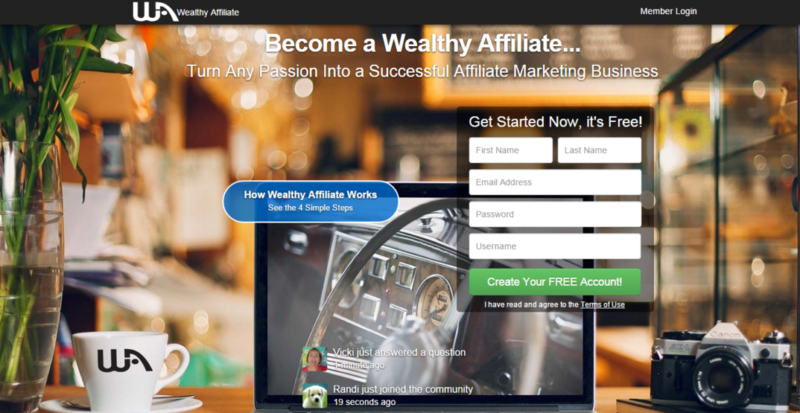 Wealthy Affiliate is an Online Business course which teaches you how to build your website and make it Google friendly by learning how to rank it on the first page of search results through SEO. The lessons are evergreen because learning about SEO is not a onetime thing – Google regularly updates its system so if you want your website to be on top, you have to keep yourself updated and learn from the best. The community there is awesome as everyone is so friendly and helpful that you won’t even need a support ticket to ask for help – I usually just drop a message to the owner Kyle when I’m in doubt but if I want immediate answers, there are always people in the Live Chat. I have been a member there for almost a year and I’m noticing that more and more of my blog posts are getting ranked on the first page which though not all of them. I’ve also made trainings and video tips of my own throughout my journey of learning and shared them with the Wealthy Affiliate community so I’ll definitely help you get started once you’re inside. SEO may be a dry subject but it is by far the best form of traffic generation (And cheapest too) for websites. There are many things that need to be taken into account when trying to get your website and its contents to rank high in Google but as long as you start small by targeting low-competition keywords and focusing on great content, those small-time websites are never going to be a threat for you and before you know it, your website is ready to face the big guys. If you’re interested in mastering SEO, learn from the very source of it through my #1 recommended program here. Thanks for reading, do share your thoughts below as I’ll be more than happy to reply.